Thursday it started snowing in Missouri pretty hard so I left work early. Get home and start doing my dailies, a JC pattern drops, sold it for 550g = Woot! Friday I worked from home because we got like 8 inches of snow, working in shorts and a tshirt = Woot. Friday night was SSC night which I got an invite to for Lurker and Tidewalker = Woot. Originally the SSC raid had no spot for me because even though I had signed up for the raid all tanking positions were filled by core members. I am not complaining, that’s the way it should be, core members > new guys, this keeps a guild progressing and gearing up the key people first. In my head it’s the way progression should be handled. One of the prot warriors had noticed that I didn’t get in and told me he wanted to be there for the Hydross kill so he could get his trinket but after that I could have his spot. The trinket did drop and he won it so grats to him. After the kill he let me have his spot because he needed no gear from Lurker or Tidewalker. The Hydross kill was a one shot, and I was quickly switched in with the other warrior and we headed off to Lurker. The GM runs his raids in what almost feel s like a boot camp fashion. If you go afk without telling someone you get the boot, if you keep messing up you get the boot, if you’re under geared you get the boot, etc. I know this would turn a lot of people off but I like the way the raids are run and it keeps people from slacking off and keeps a steady pace through the dungeons. For example, on the lurker fight the GM said if you get hit with spout you get a 20dkp deduction for not paying attention. Our first attempt went bad, people were hit with spout and just like he said 20dkp was taken from those guys (I wasn’t one of them). Next attempt we killed him extremely easily and I think only one guy was hit by the spout but he was dc’d, and no he didn’t get docked which was nice. 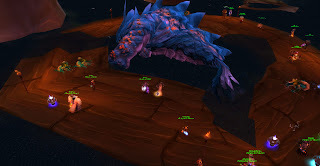 This was my first Lurker kill, and it was cool to see the big fish down, but since this wasn’t a guild first there was no cheering/happiness which kinda sucked. After the Lurker kill we headed off to tide walker, again this is a guild farmed boss so he went down easily. As a non-MT prot warrior I feel pretty useless on this fight, I didn’t really have a specific job to do so I slapped on the old dps set and went to work using devastate spam. I actually did 550+ dps for the whole fight which I guess isn’t too bad for a prot warrior. After the Tidewalker kill we called it a night, with the idea of killing Void Reaver quickly on Saturday then going back into SSC for attempts on Leo. Saturday night was a UFC night for me so I missed out on the raid but I heard they killed VR but not LEO. 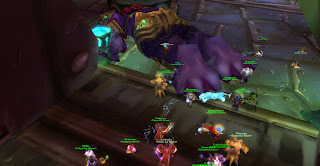 As a guild they have not downed Leo yet so I hope I’m in the raid on the night they do kill him, it’s much more exciting to experience a boss kill for the first time when it’s a first for the guild as well. I still have concerns about consistently getting a raid spot but hopefully I made a good enough impression in my Kara group and in my performance Friday that I can keep getting invites. I actually am not even going to make a big deal about killing these bosses for the first time since i was basically just along for the ride. At least I earned some DKP Friday and was able to start climbing that ladder to get enough to start earning loot. I must punish a previous guildie. St.Louis has a major Ice storm.